"They come in V-8 ?? I'm getting one" !! Why go away from the 2jzgte. i don't like the idea of a v-8. i just love the way the mkiv looks and it will never be the same. i like it . . . it looks way too expensive though. Why go away from the 2jzgte. i don't like the idea of a v8. i just love the way the mkiv looks and it will never be the same. agreed. but just the sound of a supra w/ a v8 from the factory gives me a feeling in my pants and chills down my body...brrrrrrrrrr! and if you dont like the v8, you can always swap in the 2jz, oh ya. 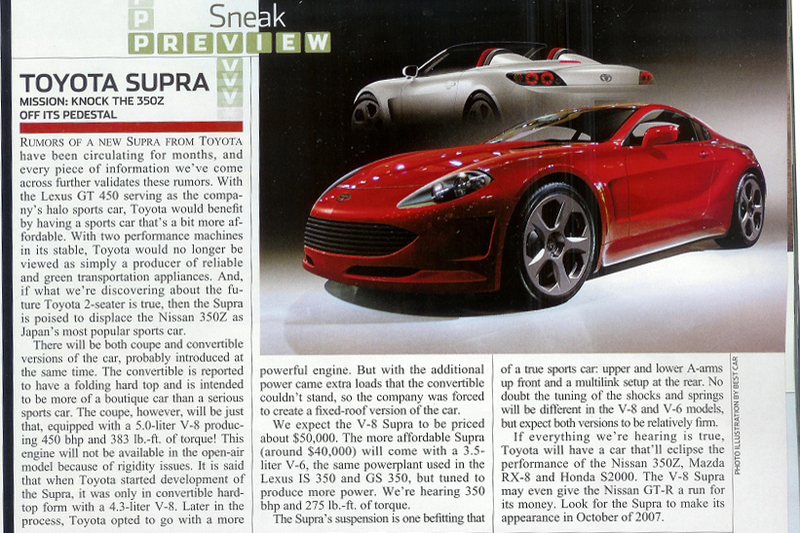 do you want the same thing as a Toyota Supra V-8??? Go to your nearest Lexus Dealer and buy a SC430.... Same car different badge.